Above-ground pools vary in size from small children's wading pools to large 33-foot-diameter round pools that hold as much as 25,000 gallons of water. However, the 24-foot round model is the most common pool size. The cost of these 13,600-gallon backyard recreation centers depends on the quality and size of the pool, of course, but also on whether you are having it professionally installed or are doing it yourself, and even on your home's location. The average cost of an above-ground pool, including installation labor, is around $7,000 (vs. the $30,000 or so for an average in-ground pool), but larger above-ground pools with "extras," such as slides, ladder and decking can easily push the price up to around $15,000. Here are some of the variables that go into the cost of an above-ground pool. Above-ground framed pools can be left in place permanently. The type and quality of the pool is the first consideration. There are two general types of above-ground pools: ring, and frame. Ring pools are made of heavy-duty vinyl, and they have an inflatable ring at the top of the pool that rises as the pool fills with water, lifting the sidewalls into place. The filled pool is tapered in shape, wider at the bottom than the top for greater stability. A 12-foot ring pool holds about 1,400 gallons of water, and can be purchased for less than $500. It is also very easy to install yourself. Most frame pools are 48 inches to 54 inches high, requiring an entry ladder. Sometimes professional installers partially bury the framework, which can slightly increase the depth of the pool to 6.5 feet or so. Very low-end model frame pools can be purchased for less than $2,000, but the quality may be suspect — which is reflected by shorter warranties. 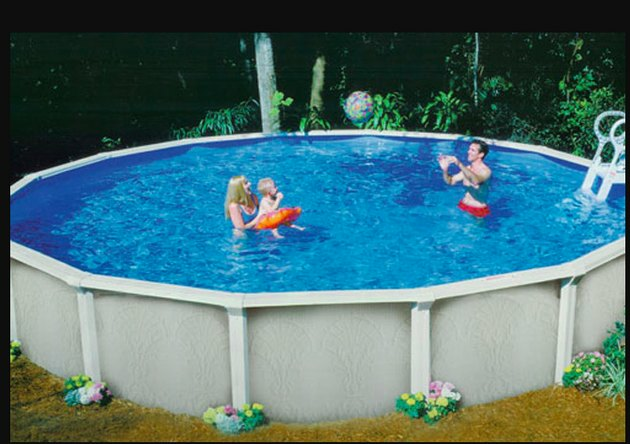 A good quality but basic 24-foot frame pool with protective coatings on the frame, a good-quality liner and a 30-year warranty costs about $3,500 to $4,000, but it's easy to double this price once you add extras such as a patterned liner, or a wood frame and deck. Items such as an extension pole, leaf net attachment, curved wall brush, vacuum head, solar cover, winter cover, backwash hose and enough balancing chemicals and chlorine to start the pool and continue for the first month of operation, should cost an additional $500. And there are other products you may want to consider purchasing, such as foam bottom, foam walls, pool cove, an automatic pool cleaner, a ladder pad, pool stairs with handrails, a pool alarm and a thermometer. These products all enhance the pool experience by bringing comfort, ease and safety to pool owners and guests. These additional items can add another $1,100 to the cost of your package, but are worth the price in the benefits they produce. A significant part of the cost of a pool is the cost of the labor it takes to install it. An experienced four-person crew starting at 7 a.m. and working straight through with one lunch break should be able to finish in 12 hours. So you can calculate labor time as about 84 man-hours. Multiply that by the going hourly rate for labor, and you get an idea of how much the installation cost might run. For example, for a four-man crew making $20 per hour, your cost would $1,680—but it might be more or less if labor costs in your area are different. This is based on no delays for delivery of either sand or water. Masonry sand usually provides the base for the pool, and a municipality may have to deliver water if there is no other water access. This also presumes that the pool location has level ground — if not, a small bobcat or bulldozer with operator may need to be hired to level the ground. A good ballpark estimate: Plan on another $2,000 for labor costs to have your pool installed. Once the pool is installed, there are costs for routine maintenance. Owners use chlorine and care for the pool by brushing and vacuuming. Plan on spending between $90 and $100 a month to maintain the pool chemically.